LTHForum.com - Live lardoblogging and guancialebloggisimo! LTH Home > Chat > Shopping & Cooking > Live lardoblogging and guancialebloggisimo! Having been very pleased with my shipment of natural pork bellies from Northeast Iowa Specialty Meats, I decided next to try some other, more unusual things using their high-quality pork. 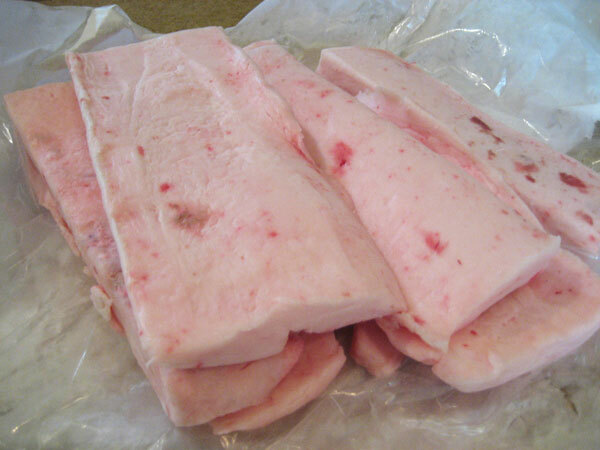 So, after some back and forth, I managed to reserve some back fat for making lardo, cured fat, and some hog jowl for making guanciale, most talked about here in this thread about perhaps the most famous dish in which it is a key ingredient. First up, both because I knew exactly what I needed to do with it and because it was more thawed by the time it reached me: lardo. One problem was, while Charcuterie says to find a piece about 3-1/2 lbs. and fairly squarish, I had about six pieces, five lbs. total, and most of them wedge-shaped. Mindful of BillSFNM's caution about the degree to which the cure is absorbed in uneven cuts, I picked out the most even cuts I had, trimmed them up a little, and laid out four pieces close to the 3-1/2 lb. total weight in a dish. Wrap it up tight and dark, weight down with a couple of bags of flour, and into the fridge it goes for about 10 or 12 days. Coincidentally, I have a double batch of lardo curing in the fridge. 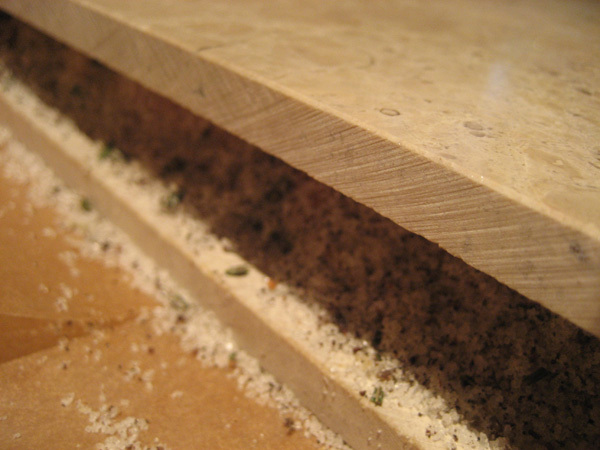 The pieces are only about 1" thick so I'm going to sample after 8 or 9 days to judge the salt penetration. I prefer to use the more appealing name, "white prosciutto". Doesn't that sound far more appetizing than "lardo"? 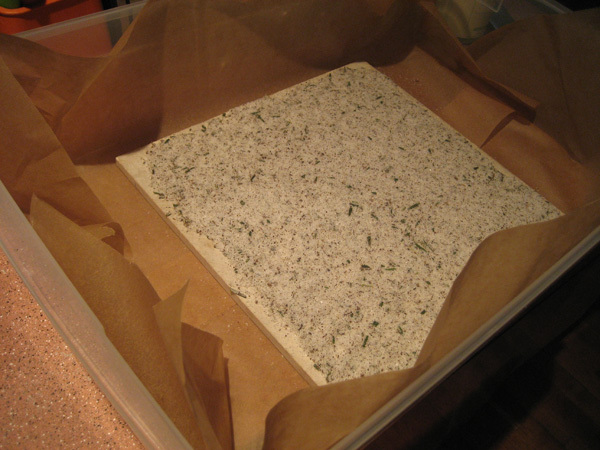 Are you going to hang it to dry after curing? In what? I have a few recipes that involve no air drying. Thanks, I was wondering if you'd suggest a shorter time, given that these sort of slope from about 1" to 1/2". My wine fridge allows me to precisely set the temperature; humidity is going to be your challenge. I shoot for about 60F @ 50%-60% relative humidity for this type of product. You should definitely get a thermometer/hygrometer. 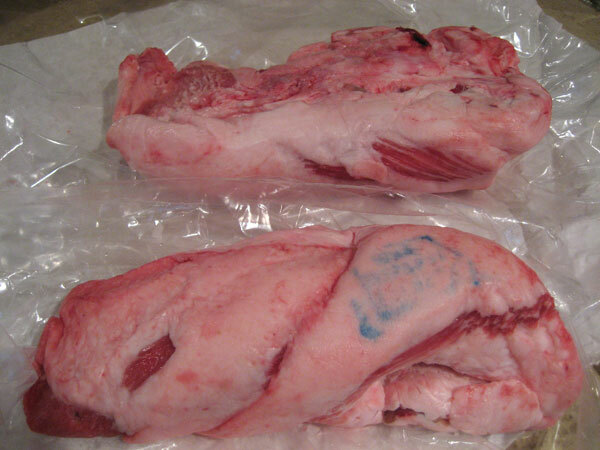 Two hog jowls, complete with USDA stamp. I trimmed them up a little, then the question came... pink salt aka Prague Powder aka curing salt aka nitrite, or no pink salt? Mario Batali said no pink salt. Salt and sugar and drying, good enough for him. This guy who experimented before me asked chefs who also told him no pink salt, and lived to tell the tale. Then I asked Ronnie Suburban... he said he'd done it both ways but that without the pink salt, it didn't have that exceptional ham-like porkiness. He was firmly pro-pink salt. 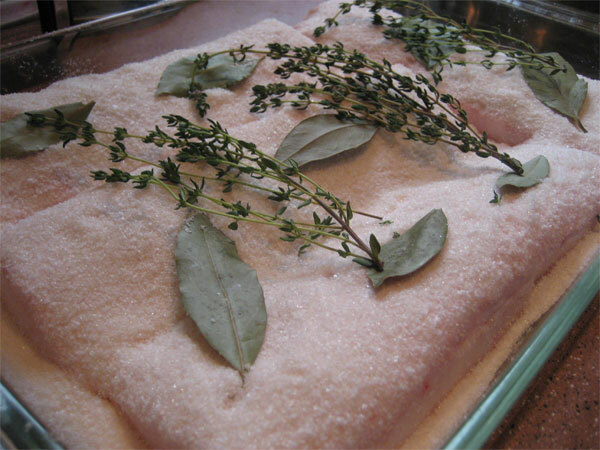 One with pink salt, one canonically following Batali's recipe exactly. How much were these pig jowls? I didn't see anything on the meat website from which you bought listing prices of these delectables. If they're there, then I'm a moron. So far, practically nothing I've ordered from them has been on their price list (although they threw in some brats and stuff this time to fill out my box). However, I correctly guessed that any pig which had shoulders and so on would also have a belly, some backfat, a couple of jowls and so on. In other words, I asked them if they could get me some of this other stuff-- occasionally I've had to explain to them what some of it, like leaf lard, was-- and they've put in the order with their processor to reserve this or that for me. As the backfat shows, sometimes I'm getting it in the way that's convenient for the processor, not ideal for me, but you know, that's the difference between buying direct from the farmer and buying at the Super Kroger-Mart Plus. The price per pound for some of this not-found-at-Jewel stuff is often absurdly low-- a buck and change-- though shipping nearly doubles it, at least increases it by about 3/4ths. Still entirely reasonable and the quality is just wonderful. Anyway, though I'm certainly happy to encourage others to patronize them specifically, it also just shows that any of us, with a little internet sleuthing and email back and forth, can find and develop a supplier relationship for good stuff-- as Vital Information has with Wettstein's, for instance. Finding interesting ways to use that much lardo isn't hard. 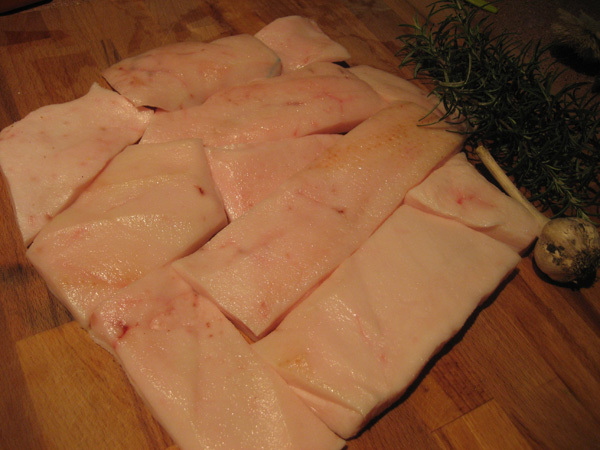 One that I have enjoyed greatly is to use the lardo instead of back fat in my sausage recipes. I only do this for fresh and fresh/hot-smoked sausages. I guess you could use it in cured sausages, but double-curing isn't something I feel comfortable doing. 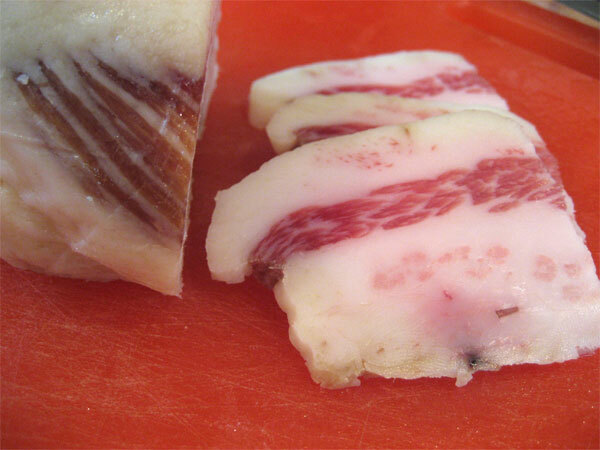 You can also use your guanciale and cured pork belly in sausages. You just need to crank down the salt. I'm curious about this one. It's the only thing I've tried curing that started out so free of liquid that the salt and stuff around it has remained dry after days of curing; it never expressed any liquid to turn it into a brine. 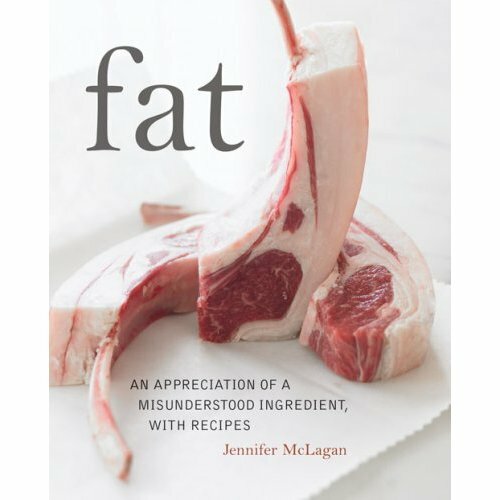 So is the flavor of bay leaf and thyme really getting through to the fat? Is salt, even? What will it be like in the end? We shall see. Top is with, bottom without pink salt. Interesting thing, in the one with pink salt, the pink salt seemed to have some effect on the thyme, bay leaf etc. because some of its green pigment dissolved into the brine, giving it a sort of olive oil color, which accounts for the slight greenish cast to the hog jowl at top. The one without pink salt didn't pick up any of that green color. Anyway, twine around both jowls, now hanging in my downstairs fridge pending transfer to a permanent holding facility for three weeks of wine-fridge-aging. Thank you, Mike for helping me to solve an old mystery. 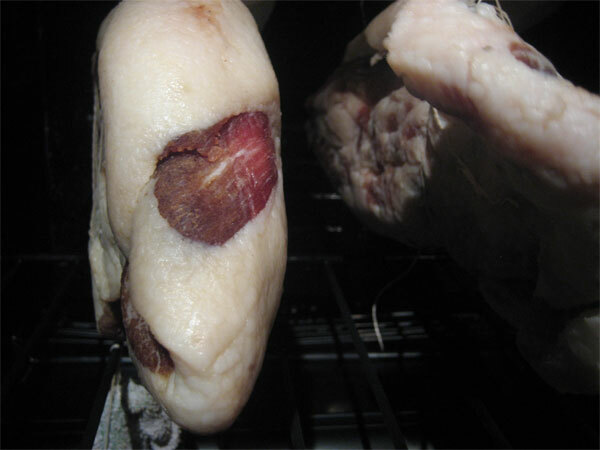 When I last cured jowls (about a year ago), they took on a similar green color. I couldn't -- until now -- understand why it had happened. I asked around but no one could really figure it out at the time -- not even an expert in the field of cured meats, from Ohio State University. The jowls did look a bit freaky but since they smelled and felt perfectly fine, I decided to continue on with the project. The one detour I took was that I ultimately made them into jowl bacon, rather than guanciale, by hot-smoking them to 160 degrees F. After that, with a little trepidation, I cooked some of the bacon up and it was delicious. Eventually, I worked through both jowls will no ill effects. FWIW, I never fed it to anyone else without giving them the whole story. Anyway, I now understand why my last jowls had that green tint and I'm so happy to know that I didn't discard them for no reason. Such an obvious answer that, until now, had eluded me (and others). Thanks, for the useful information. Well, mind you, that's just my theory... the smell otherwise seems identical (and fine), so whatever it is, it seems harmless. Yeah, all you photo contest enterers, take that! Study In Pink And White, by Mike G.
Mike brought over his lardo and guanciale for a three week wine frig vacation. 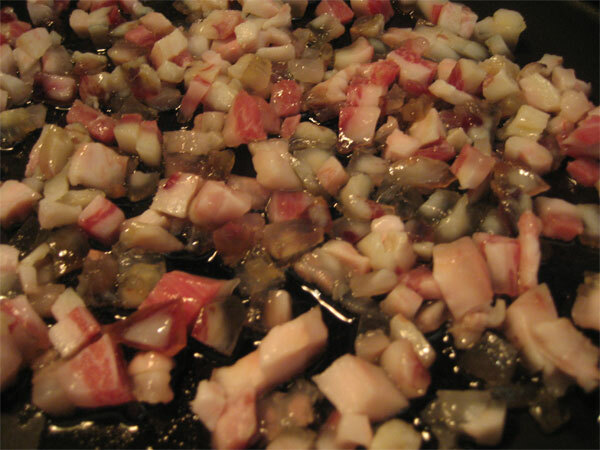 Lardo looks very nice, but there is something extraordinarily appealing about the guanciale. Has it been three weeks yet? Very cool, guys. You are allowed to taste little samples during the drying process. I slice off a sliver every few days. 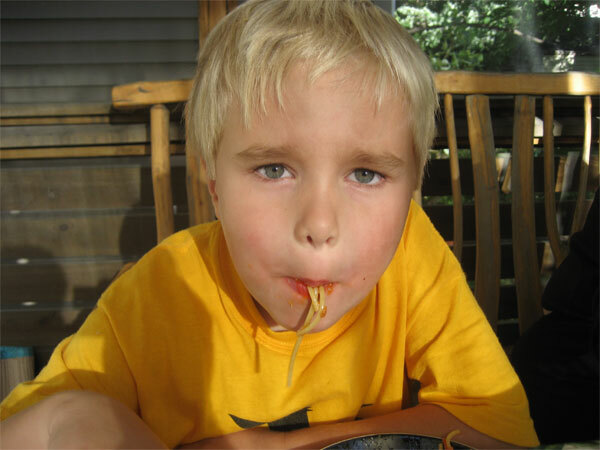 It is interested to see how the texture and flavor develop. Are you able to monitor the relative humidity in the cooler? Yes, there's a hardware store thermometer/humidity thing in there and, as you can see, an extremely high tech humidity maintenance system consisting of a wet washcloth whose end sits in a small cup of water. When last I checked, which was not that long after everything was assembled, humidity was between 50 and 60%, so considering we're making something that typically hung in a cellar, I figure we're reasonably close. Thanks to Ms. Wiv for allowing use of her wine fridge for my avant-garde art installation. That art installation is indeed a thing of beauty. Incidentally, I have an unused refrigerator in my home office if you ever get push-back from Ms. Wiv about using the Wiviott wine cellar for your pork. Well, you're aiming for a temp of 60F, which a regular fridge probably can't hold without modification. But thanks. 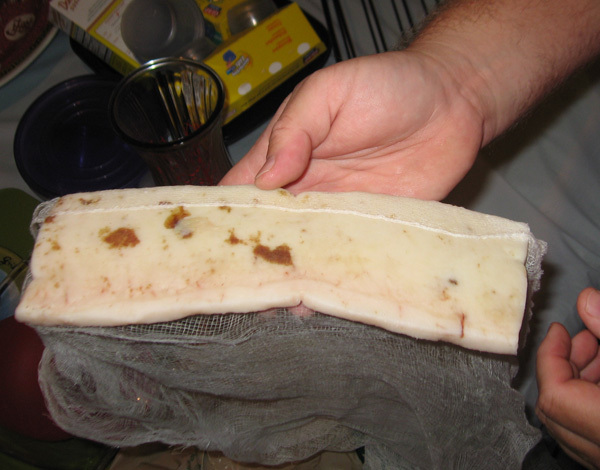 Mike G wrote: ... lardo and guanciale were ready to air-dry, the lardo being wrapped in protective cheesecloth because it's more light sensitive. 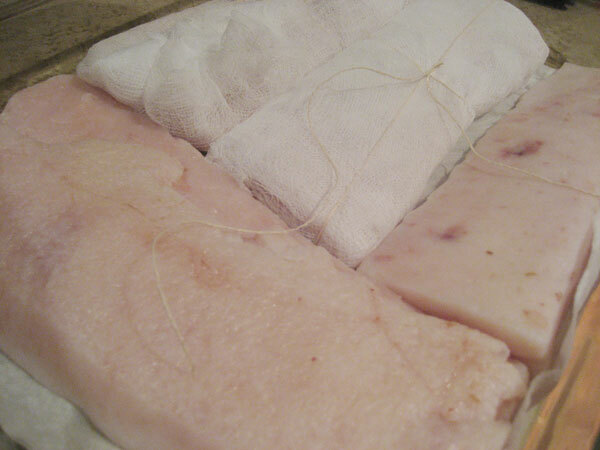 I wonder about the wrapping of the lardo in cheesecloth. Isn't it dark enough in Mrs. GWiv's wine cooler? The humidity in my cooler varies as it cycles on and off to maintain the set temperature, usually between 50% and 70%. My concern would be that the cheesecloth might retain moisture at the surface of the lardo, perhaps creating an environment suitable for the growth of undesirable organisms. I have observed that higher humidities favor such cultures. Just wondering. Bill, I have just that problem in the new house: the wine cellar is much more humid than in the last house and it's making my guanciale rather, uh, schifoso. Choey wrote: Bill, I have just that problem in the new house: the wine cellar is much more humid than in the last house and it's making my guanciale rather, uh, schifoso. Controlling the humidity, especially reducing it when it is too high, is the hardest part for me. I've tried several "food safe" solutions and have had some limited success with Eva-dry EDV300. One man's schifi is another's delicacy (or ride to the ER)! By my count, the three week mark is today, Mike... news? Report forthcoming soon, I'm sure. Well, here's where things stand. Humidity has been reasonably in the 60% range but temperature in the supposed wine fridge has never climbed above the mid-40s. So at 4-1/2 weeks, the stuff looks and feels like it's curing and drying, slowly, but also like it could still use another week or two to get to a real level of Italian guanciale and lardo textural toughness. I think. We think. Maybe. Any thoughts? No off smells, everything looks and smells okay, as you might expect as it's essentially being refrigerated, not just kept at cellar temp. Hack off a piece and taste it! There at at least two separate processes going on here. First is the drying that is controlled mainly by the relative humidity of the chamber. But then there are a whole series of complex chemical reactions that change the structure of the proteins and fats that give dry-cured meats their amazing texture and taste. The lower temperature may be slowing down or inhibiting some of these reactions. Spoilage is less likely, but the final product may be different (not necessarily inferior) from what you are expecting. Could be even better. Ya never know. So at long last I can complete the lardoblogging and guancialeblogging. 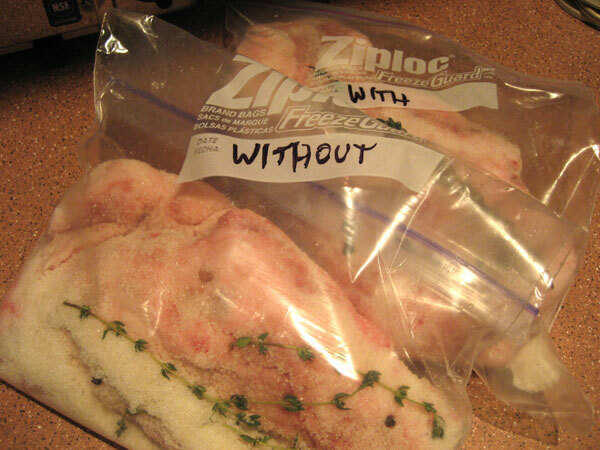 To recap, the lardo and guanciale hung in a too-cold wine fridge for much longer than normal. Did all the reactions that are supposed to happen happen? I suspect the lower temp did retard some of the things that are supposed to happen. First I took out the lardo and unwrapped it for the first time in weeks. 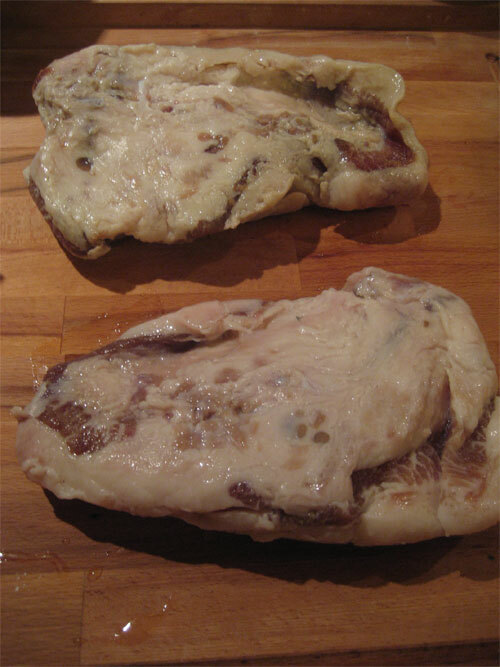 The brown spots are stray remnants of meat from where it was trimmed, not anything scary. (You can see the same piece in the second photo of my original post.) It all looked fine and smelled fine, GWiv was squeamish (this from a man with a year-old ham hanging in his basement turned to either prosciutto bliss, or Hell Ham) but I tried some, briefly sauteed. It tasted okay... like nothing much really. Like fat. No prosciutto taste, no thyme or bay leaf taste. Nothing much at all, frankly. A disappointment. 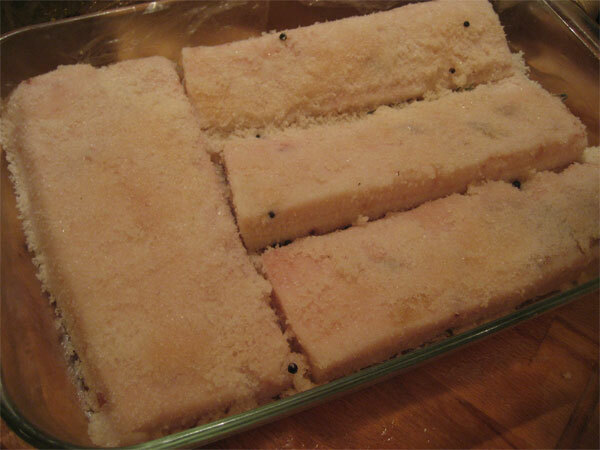 I don't have enough experience with lardo to know, is this all it ever tastes like or is that a pale shadow of what it could be, but it doesn't do much for me. And now I have lots of it. 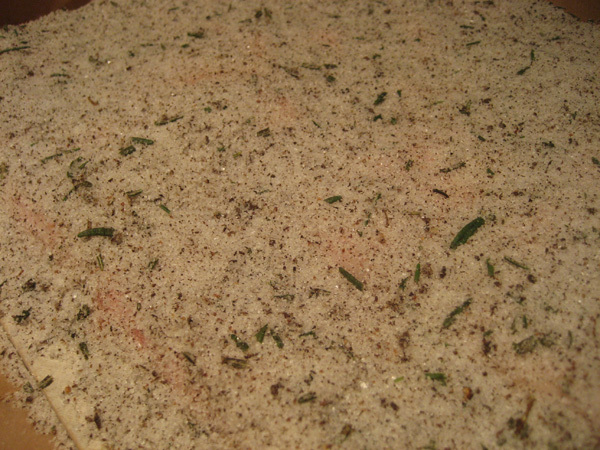 On to guanciale. I cut up the jowls into approximately 6-oz. 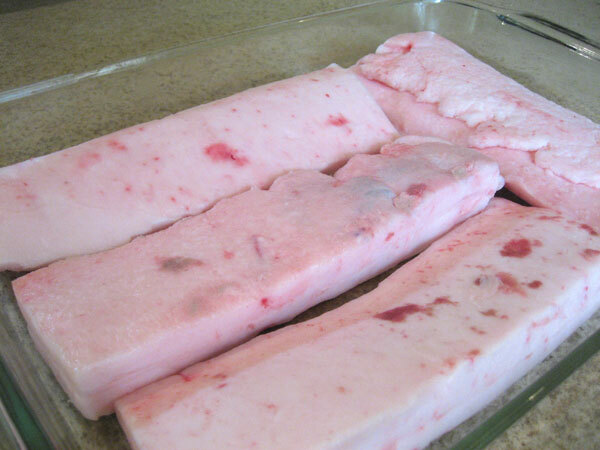 chunks and vacu-sealed, marking them as "with pink salt" or "wo." Frying a few slices up, the "with pink salt" had a little more of a bacony taste, the "wo" had a little more straight salt and funky cured meat taste. I'm not sure which I'd say I prefer, yet. 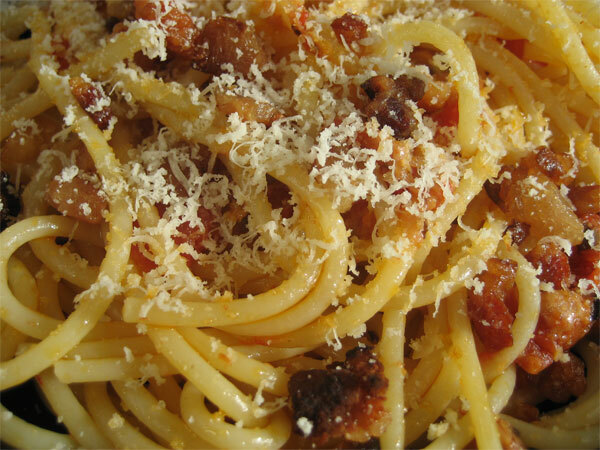 This is one dish for which Romans insist on using guanciale, or cured pork jowl (see page 94)-- but as noted, it's almost impossible to find in the U.S.
Not at my house it isn't. Cheese, bacon-like guanciale, tomato, bacon fat-like guanciale fat... it went over big with the kids, and the rest of us too. Oddly enough, what it's sort of like is calamari. It's a solid piece, not gooey like the lard at Szalas, with a kind of rubbery texture. What a delicious looking, and I am sure tasting, endcap to your PPG*Blogging saga. During the production of my current Sky Full of Bacon podcast, starring Vital Information's pig head, Rob/Vital also gave me the back fat from his hog. It sat in my freezer for a month with no particular end use in mind. That changed with a conjunction of recent events. One was tasting the house-cured lardo at Vie last Friday. Although Mike Sula and I both found it a little too sweet for our tastes, overall the complexity and lushness of the thinly sliced fat inspired me to want to give lardomaking another shot. Finally, I lay the other marble tile on top, and then weighted it down further with some old leftover tiles, which won't touch food. OK. It's about 6 months. Have you tried it yet? I've got a batch in brine that's been curing for a month now. Getting ready to take out out and hang/dry for another few months.